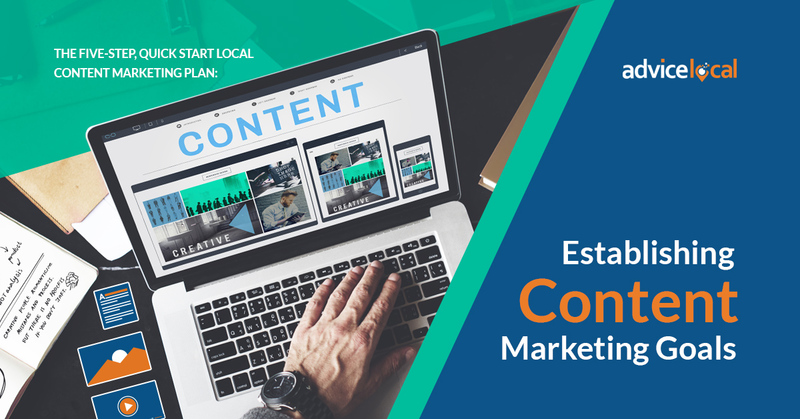 In the post, The Five-Step, Quick Start Local Content Marketing Plan, I described the five steps involved in creating a basic local content marketing plan. While it’s a great basic local content marketing plan to get you started, you really need to dive deeper into each step. I’ll be taking you on the deeper journey starting today. Let’s go in-depth on the first step: The Goal – Identify the Action You Seek. While this step is obviously about goal setting, let’s instead focus on the action that you want to take place. It’s too easy to define goals in a vague way that is often not measurable. If you ask a random business owner about their goals for content marketing, they are likely to respond with something general, such as “get more customers.” While that’s obviously the goal for the long term, it’s not particularly useful in this case. Why? Because it will be difficult to measure which marketing activity was successful in getting the new customer. Was it a result of content marketing? It could have been the result of something else altogether, like a competitor going out of business or new construction diverting more street traffic to the area. If you are specific in stating a goal, and if you assess that goal against verifiable measurement indicators, it will be far easier to learn what you did right – as well as identify what needs improvement. Effective goal setting is closely related to the “sales funnel” of a business. This is the process of moving a prospective customer through several stages of involvement with a business, ultimately (if all goes well) ending with that prospect becoming a customer. Names for each stage of the funnel vary by industry, but generally there are five stages that are expressed in terms of audience segments or marketer actions. I use the following scheme, where each part of the funnel is labeled with terms referring to the stages of a content marketing plan. After choosing the names for each stage within the sales funnel, you can establish a goal for each funnel stage. To illustrate, let’s use the example of an architect who designs homes in an upscale area near Atlanta. His firm can design about 15 homes per year, and since he now has 10 clients, his overall goal is to get 5 more clients to sign contracts within the next year. In this case, his goal for the Attraction stage might be: “Capture the attention of at least 300 people interested in architecture and home building who live in the Atlanta area, and do so by the end of FY 2017.” But why 300? Because the architect knows he must attract many people to attain at least 5 qualified customers in the end. The next step for the architect is to create quality content about building ideas, styles of architecture, luxury materials, decorating, and other topics that are likely to attract people interested in building a new home. Because his homes are located in an upscale community, the architect decides to focus on the luxury market, thereby further defining his target audience in terms of income, not just geographic area. Being this specific helps him develop content that is more likely to appeal to his target audience. Let’s say this strategy works, and 300+ visitors are attracted to the architect’s website. They view his portfolio and read some articles. Some click on a link and go to the firm’s YouTube channel to watch a video of a custom home being built. Some visitors comment on the articles and a few request more information via a site link. Those visitors who clicked, commented or requested information have entered the second stage of the funnel. They are engaged! Using Google Analytics, the architect can see what pages they visited, how many people clicked and how many filled out a form. Hopefully he created a list of all the email addresses of those requesting more information, and put them into a special email list for follow-up. Now the architect must write an action goal for the Nurturing stage of the funnel. The people on the email list require nurturing, so at this point content marketing efforts aimed at this group will move to an email platform. Email is great for this group as the message can be customized to each individual prospect. It allows the architect to develop a deeper relationship with those prospects that show the most promise to become clients. If the architect succeeds in meeting the Nurturing goal, the next phase will be to develop a goal for the Selling stage, and so on, all the way to the funnel’s end – and that’s where people sign a contract for a new home and the architect delivers his services. I’m refining my content marketing plan! Thanks @Advice_Local. While all of this is going on, the architect continues work at the top of the funnel, using local content creation strategies to attract more prospects to the website. The architect must continually review the analytics to determine which pieces of content were most effective in moving prospects through the funnel. This valuable information will guide content development activities in the future. Managing an actual content marketing plan is seldom this straightforward. Expect bumps in the road and missed opportunities along the way, particularly if you are trying to execute content marketing while also running a business. Read the next post in this series now. Local content marketing is cost-effective, measurable, and most importantly, gets results. Get started today!